The new version of Parallels® Mac Management for Microsoft® SCCM brings one of the most-demanded and long-awaited features: internet-based client management for Mac computers. From the very first release of Parallels Mac Management, our goal was to extend all the capabilities of SCCM to Mac computers. Internet-based client management for Mac fills the biggest gap between Mac computers and PCs in terms of systems management capabilities. It allows our customers to keep their Mac computers in compliance no matter where those computers are—on the corporate LAN or on a public network somewhere across the globe. The ability for Mac devices to connect to SCCM from Internet brings a new level of flexibility and control for both system administrators and Mac users. Such flexibility will be especially beneficial for companies that employ road warriors, or staff working at home. Ensure SCCM itself is configured to enable connections from the Internet. 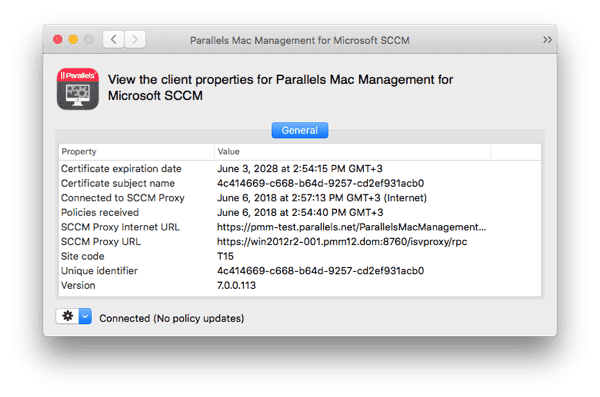 Install Parallels IBCM Proxy, which allows Mac computers to communicate with SCCM from the Internet. Configure the communication channel between Parallels Proxy and Parallels IBCM Proxy. And that’s it—managed Mac computers will be automatically configured to access SCCM from the Internet via the newly installed Parallels IBCM Proxy. When designing the architecture of Internet-based client management for Mac, we kept the focus on security. 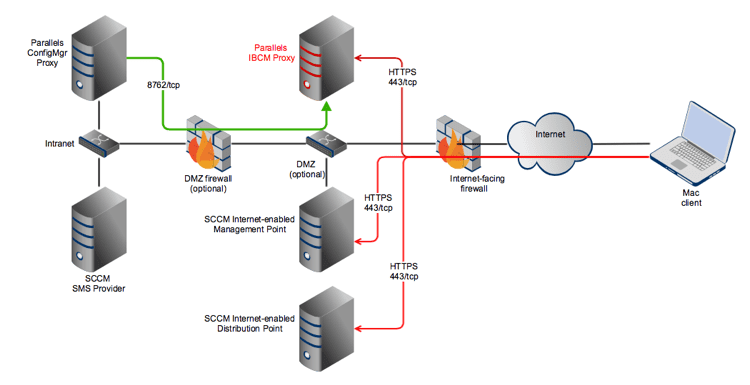 Parallels Mac clients communicate with Internet-enabled SCCM management points and distribution points over HTTPS. 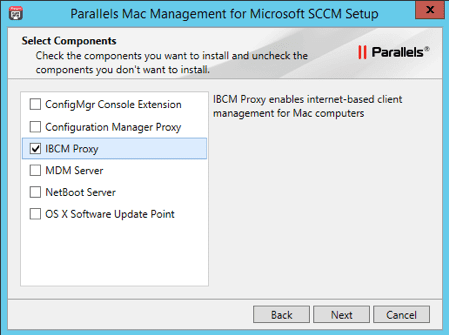 When they need to access SCCM itself, they communicate through the Parallels IBCM Proxy. Parallels IBCM Proxy is plugged into Microsoft IIS (version 7 and higher), which is the industry standard in terms of security. In turn, the communication between IBCM Proxy and SCCM Proxy goes through the secure SSL channel, and the trust between parties is established by a certificate-pinning mechanism, which is under full administrators control. When it comes to security, the situation is constantly changing, and reaction time is a critical factor. As an administrator, you will definitely want the latest security policies to instantly affect managed Mac computers. Internet-based client management addresses exactly this need. No more hassles with VPN just for a connection with SCCM. No more troubles with Mac computers being out of sync because they are somewhere in the field. Internet-based client management means your Mac computers are perfectly secure; they’re always in sync with the latest system and software updates and security baselines. It’s also good for Mac users, because they always have the latest software available for them to boost their productivity. Internet-based client management for Mac is a great addition to Parallels Mac Management, but we have something else for you in the latest release.